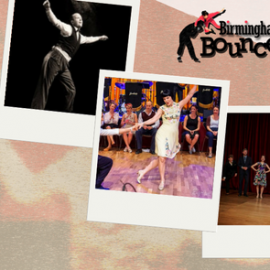 Latest News – Scott Cupit and Jenny Thomas will be joining the Birmingham Bounce to bring their unique blend of energy and love of swing dancing to Birmingham! In 2009 Scott gained an amazing amount of media attention with his interactive and swinging hour on the “empty Plinth” in Trafalgar Square. Voted one of the top ten hours of the whole project by the Evening Standard Scott bought 100 of his London dancers to be involved and the footage is spectacular. The story gained global attention with articles popping up in Texas, all over Australia, Germany and Britain. Even the Fiji Times ran a story. Scott still teaches weekly as well as running the business. He is often invited to teach abroad and at local scenes around the UK. After 17 years he still thinks he has the best job in the world. Jenny began Lindy Hopping 24 years ago in Anthony Van Laast’s show “Souls in Motion” where she joined Ryan Francois’ dance company Zoots and Spangles. During those years Jenny has travelled the world teaching Master Classes, sharing her extensive knowledge of dance technique and exposing countless people to her love and passion for the dance and continues to do so. To many in the swing dance community she is thought of as one of the “Teachers Teachers”. Performing on some of the most prestigious stages in the world – The London Palladium, Royal Opera House, Radio City Music Hall, Carnegie Hall, The West End & Broadway. Including Soloist and Assistant Choreographer for the Original cast of The Broadway Musical SWING , The Tony Awards, Macy’s Day Parade and The Blockbuster Movie The Polar Express with Tom Hanks. Jenny has even performed at Her Majesty The Queen’s residence Buckingham Palace with the boys from TAP DOGS which led to a collaboration with Paul Robinson, Dougie Mills and Joanna Goodwin creating The Tap Team, which gave regular classes at London’s Pineapple Studios and toured England giving masterclasses. Strictly Come Dancing, Strictly Christmas Special, The Peoples Strictly for Comic Relief, Strictly Dance Fever, So You Think You Can Dance and USA’s Dancing With The Stars and Jazz/Tap coach on ITV’s Dancing On Ice.